As it’s our first post – I’ll summarize PositionDial super-quick..
Seen a trending issue, news story or blog post? Want to see a different perspective? Think there’s a different side you’re not being shown? Check PositionDial – whether left, right, traditional, progressive, pro-independence or pro-union – we show you the different sides of the story in one place so you’re not left wondering. React to Position statements to get your PositionDial – a dynamic, living representation of where you stand on the issues you care about. Excited to be part of the @PositionDial launch at @PolisLSE. Do you know where you stand? Action matches show you which brands, organisations and MPs line up with your position. We’ve started with an initial spread of companies and UK politicians – and are building up. If there’s a politician or (independent) company data source you’d urgently like us to add, just let us know. Our MP action matches are powered by data positioned (by us) from TheyWorkForYou.com. During the event I spoke on the deep problems our research at PositionDial has uncovered: from a lack of trust in centers of power, to the decline in participation at elections, to difficulty seeing and navigating different perspectives (aka the filter bubble), to the huge and growing demand from people, institutions, politicians and businesses alike, to know, understand and make better decisions in relation to the issues that matter. Organising everything by position and perspective makes it easy to see, compare and find everything in an entirely new way. He’ll be sharing more of how he’s making it all happen here when some feeling returns to the end of his fingers. It was a great crowd in the room – we heard a raft of sharp and insightful feedback. If you were there.. be assured not a word was wasted and we will be discussing your ideas in the pages of this blog and more importantly (in keeping with the pd spirit) turning them into action. We were also super-stoked to host a fascinating debate on austerity between Richard Seymour (writer at Leninology and The Guardian) and Harry Phibbs (Conservative Councillor and regular at Conservative Home). Their totally different perspectives on austerity, the UK economy, and the global financial system more broadly – powerfully brought to life the value of hearing both sides of the story. 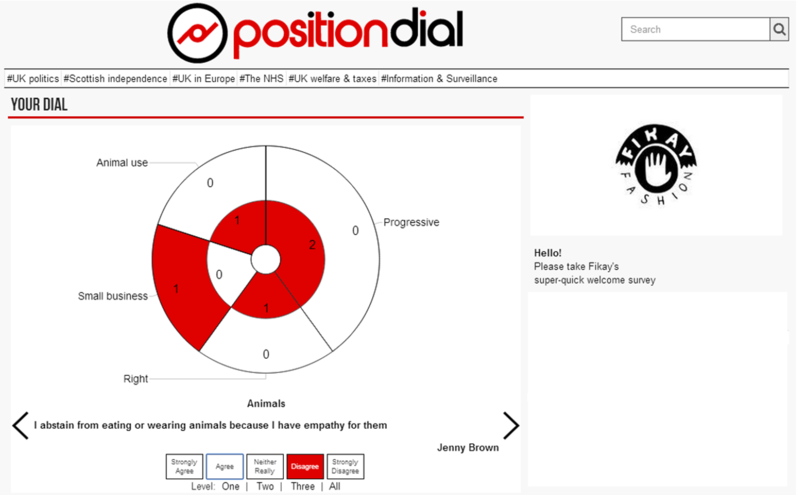 You can listen to their debate here (Dropbox audio download) and react to Position statements from both on PositionDial. For PositionDial to work it needs to be powered by everyone. You can add media and opinion right now by clicking on the ‘Position empty’ sign and we will be adding more ways to contribute as the weeks roll on.